The modern father of the Libertarian movement is Mssr. 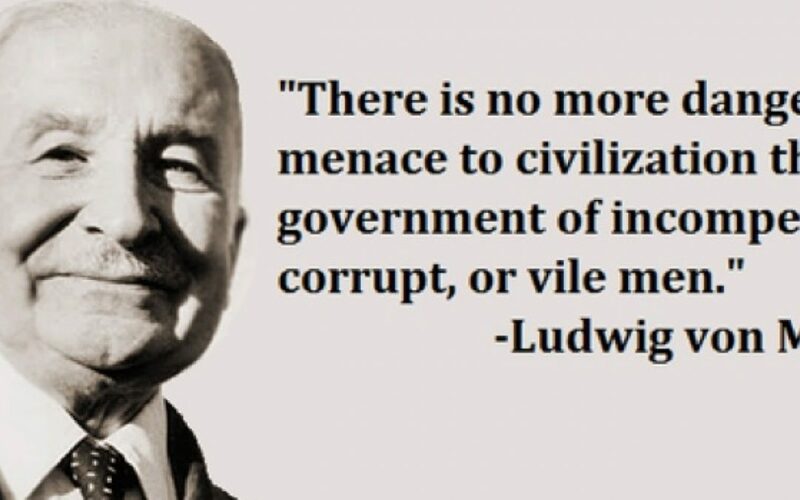 Ludwig Heinrich Edler von Mises, and it can largely be accredited to his genius that the Libertarians have any power. Ludwig von Mises was a student in spirit of Thomas Jefferson’s political and economic principles, and it was this knowledge that helped him foresee the collapse of socialist economies and provide a solution to the recessions and depressions that would actually work after the Great Wars. In modern banking there is the concept of spending credit and inflating currency value to promote spending in a downturn. These are principles that have not served this country well. Inflating the currency value has created a crash, and spending money one credit where it is not there to validate has created a multiple trillion dollar debt. I think any rational being would say these are not sound economic principles for a country’s survival, and yet the United States keeps repeating the same mistakes. Von Mises advocated, as did Jefferson in less modern terms, limited government spending, and when in debt to pay it off as quickly as possible. Von Mises additonally argued against spending on credit during a recession to boost the economy and instead to cease government spending, and Jefferson would have agreed as he did similarly. The cessation of government spending, especially on wasteful programs and military that is not needed during peace-time creates debt when there is not the income to cover it. This is an inherently flawed economic principle for a country like the United States. Other countries, like the majority of Europe, compensate for their government program with an exceptionally high tax rate on all citizens to cover those costs. The United States does not, and thus, cannot create the income to cover such expenses. European countries have smaller militaries, creating less cost. Many countries do not have diplomatic missions in dozens of countries, especially smaller ones. This is a waste of government spending. These are factors that our current political class should consider when creating policy and a budget. We do not have to totally follow Mises and Jefferson down the path less traveled, but considering their success and intelligence concerning economic policy would be a great thing to do for the well being of this country.